During a stint as writer in residence, November 9–11, novelist Gish Jen (Mona in the Promised Land; World and Town) delivered a Lowell Humanities lecture, taught a student writing workshop with novelist and English professor Elizabeth Graver, and met with English professor Min Song’s Asian-American literature class. Sponsors of her visit included the University’s Institute for the Liberal Arts, which promotes interdisciplinary study and innovation, and Fiction Days, which brings writers to campus. At her Lowell lecture on November 9, Jen described her writing process for an audience of 200 students and faculty: “My characters come to me by talking,” she said. “It’s not that I’m becoming them, but that I’m trying very hard to understand them.” In reference to a common theme of her work, she said, “No one sits down to rewrite the immigrant novel. 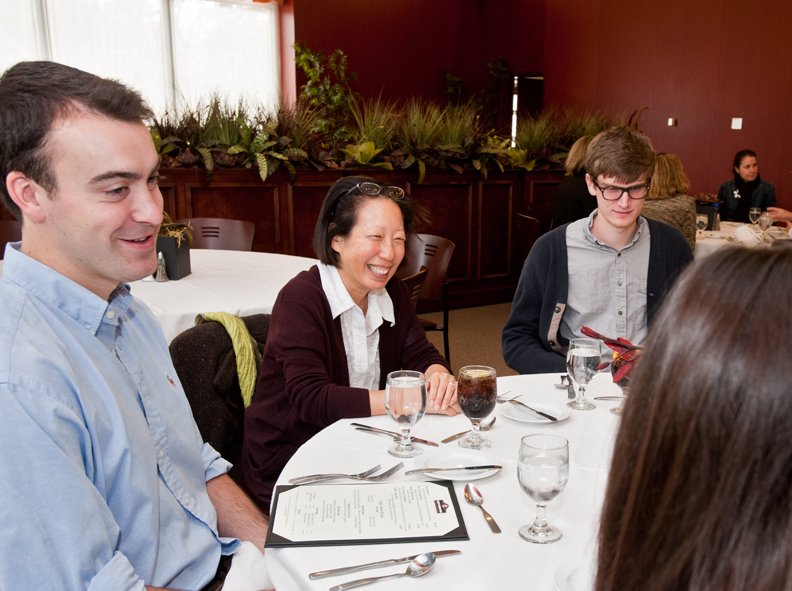 You sit down to tell a story.” On November 10, Jen was joined for lunch in the faculty dining room by seniors from the creative writing concentration, including (from left) Ben Key, Zak Jason, and Caitlin Moran (back to camera). This feature was posted on Thursday, November 11, 2010 and is filed under Featured Photo.